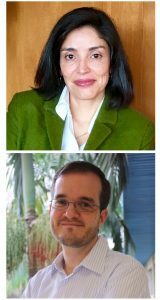 The History of Economics Society is delighted to announce that Jimena Hurtado and Pedro Garcia Duarte will become the next editors of the Journal of the History of Economic Thought. They will begin their term on July 1, 2018. Dr. Hurtado is an Associate Professor of Economics at the Universidad de los Andes. She received her PhD in Economics from the Université Paris X Nanterre. She has served as an associate editor for the Journal of the History of Economic Thought since 2016. In addition, she has been the vice-director and served on the advisory board for the Iberian Journal of the History of Economic Thought. She is a member of the editorial boards of Cahiers d’économie politique and the Journal of the History of Economic Thought. Dr. Hurtado has published widely in three languages. Her research areas includes Adam Smith, the Classical Economists, Jean-Jacques Rousseau, and Latin American Economic Thought. Dr. Duarte is a Professor of Economics at the University of São Paulo. He received his PhD in Economics from Duke University and his Livre-Docência from the University of São Paulo. Dr. Duarte’s research focuses on 20th century macroeconomics and monetary policy, including the work of Frank Ramsey. He is a leader in the establishment and subsequent organization of the History of Recent Economics (HISRECO) conferences. He currently serves on the editorial boards for OEconomia, Estudos Econômicos, History of Economic Thought and Policy, Research in the History of Economic Thought and Methodology, History of Economic Ideas, Journal of the History of Economic Thought and the History of Political Economy. The History of Economics Society would like to thank Stephen Meardon for his excellent work as editor of Journal of History of Economic Thought. In his five years as editor, Dr. Meardon made significant advances in the web presence of the journal, tackled enormous hurdles to make the journal easily available on-line to HES members, and instituted the new Accepted Paper Series. The latter makes papers accepted to JHET immediately available to a wide audience. Under Dr. Meardon’s leadership the journal has achieved a 5-year impact factor of 0.419. We congratulate him on his accomplishments.